Build a Free Website - Should you build a free website? How do I build a free website? That question is asked over and over again. The question should be should I build a free website? And the answer is No! Building a website that is free just does not work and is a waste of time. Your time. Most of the free website builders have restrictions, you can build a free website but if you want to create a professional website that works you have to upgrade and that means you have to pay. You decide to build a website and type build a free website into Google why pay when you can build a website for free. Great there are hundreds of website builders that offer free websites and you sign up quite chuffed as its free. The site builder is easy to use and in a few days you have your free website on the web. Great now the orders will start rolling, in or will they? The problem when you make a free website is that the website builder limits you, the free templates they give you are not professional, you have the free websites name in your domain with yours example: www.mywebsite.freewebsite.com they can also have a banner somewhere saying build a free website. They can also limit the SEO capabilities this means you have to upgrade to be able to optimize your site. 99% of the time you will need to upgrade to get all the features the site builder has to offer and this means your so called free website is not free. You could have put a lot of hours in updating content to your free website then discover you need more features and have to upgrade or work done will be lost. In short if you build a free website it will not look professional, not rank well, not have the correct SEO, and waste your time. You will need to upgrade to make a professional website. Be warned if you build a free website make sure you know exactly what features the site builder offers before you spend a lot of time placing content on your free website. 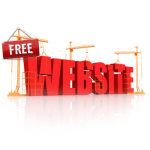 There are lots of website builders on the web that offer free websites some better than others. One that stands out is Wix. No web design or coding knowledge is needed, they use a simple drag and drop system and all the coding is done by the site builder. Wix offers a large selection of professional templates even with the free version, and whats great is that when you ready you can upgrade at a reasonable price and get more features. Hundreds of top design templates to choose. Hosting included with every package even when you create a website free. Simple and easy to use drag-and-drop editor. Choose from lots of free Wix apps. Your site will be mobile friendly. Step-by-step tutorials and videos on Wix. If you want to build a website free then use a website builder like Wix.